Just in time for Mother’s Day I’m excited to share a delicious cupcake recipe that any mom is sure to love! This recipe is packed full of special flavors to create the ultimate sweet treat for mom’s special day. 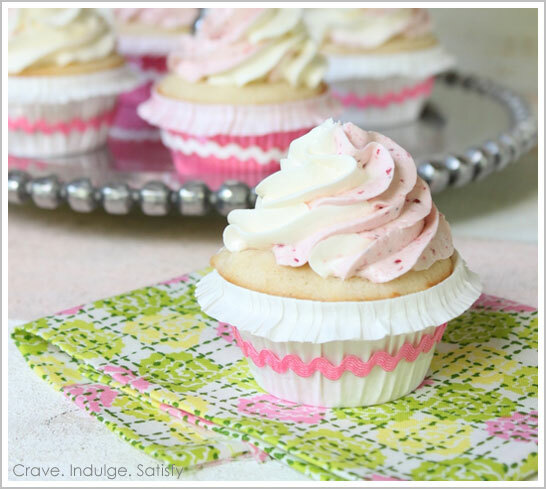 Not only do these cupcakes taste amazing, but they are displayed in some adorable DIY cupcake wrappers. Your mom will feel like a queen if you bake her a batch of these Vanilla Bean Cupcakes with Strawberry & Vanilla Meringue Buttercream. We all love a traditional vanilla cake, but these are extra special with the addition of vanilla bean paste to enhance the flavor and appearance. I love the little black vanilla bean seeds that are sprinkled throughout. To finish off the cupcakes a meringue buttercream made from egg whites, sugar and butter is swirled on top. This frosting is not your standard buttercream, but one that is more light and fluffy and not overly sweet. To give these special cakes the “wow factor” I decided to flavor the buttercream as two flavors: vanilla and strawberry, which created a beautiful white and pink swirl on top. Using fresh strawberries in the icing created a pale pink color with specs of the red berries throughout. The texture and flavor of this icing is the perfect compliment to the vanilla bean cakes. If you’re feeling a little crafty and want to take these cupcakes to the next level of fabulous then you can create your own DIY cupcake wrappers. Wilton makes some adorable Ruffled Baking Cups now in assorted colors that you can pick up at your local craft store. I grabbed some pink and white ones to fit with the color scheme of the swirl icing colors. 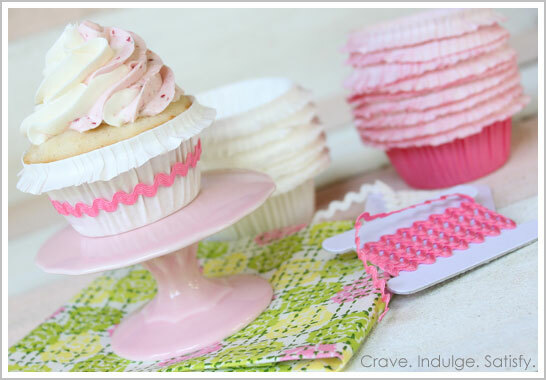 I found some adorable rick rack ribbon to match and by attaching them with double sided tape around the outside of the cupcake liners you have a super simple and beautiful way to display these delicious cakes. In medium bowl combine dry ingredients: cake flour, baking powder and salt. In bowl of stand mixer beat butter, sugar, vanilla bean paste and vanilla on medium speed until well combined, about 2 minutes. Gradually add in the flour mixture and milk alternately, starting and ending with flour. Scrape down sides of bowl as necessary. Beat egg whites with electric mixer until stiff peaks form. Gradually fold into cake batter. Let cupcakes cool on pans for 5 minutes, then remove to wire racks to finish cooling. Once cupcakes are completely cool frost with Strawberry & Vanilla Swirl Meringue Buttercream. First create a base buttercream, then modify to make the Vanilla & Strawberry flavors. In bowl of stand mixer combine egg whites, sugar and salt. Place over a pan of simmering water and whisk continuously until the sugar is dissolved, about 2 minutes. (The mixture should feel smooth when rubbed between your fingers). Attach bowl to mixer fitted with whisk attachment. Starting on low speed and gradually increasing to medium-high whisk until stiff peaks form and mixture is fluffy and glossy, about 10 minutes. With mixer on medium speed, add butter a few tablespoons at a time, mixing well after each addition. Separate icing evenly into 2 batches, one for Vanilla and one for Strawberry. To half the batch of icing, add vanilla. Switch to paddle attachment and beat about 2 minutes until icing is smooth. Place Vanilla icing in 12 inch piping bag and snip off tip with scissors. Puree strawberries in a food processor..
To the second half of icing, add the strawberries and beat until combined. Place Strawberry icing in 12 inch piping bag and snip off tip with scissors. Take both the Vanilla and Strawberry icing piping bags and place inside of a 16 inch piping bag fitted with star tip 1M. Squeeze piping bag starting on the outer edge of the cupcake and go in a circular motion towards the center to create the Vanilla & Strawberry Swirl look. Place baked cupcakes into ruffled baking cups after they cool. (I baked my cupcakes in standard liners, and then placed them in the ruffled cups. You could always just bake your cupcakes in the ruffled cups to begin with). Cut rick rack ribbon so that it will wrap around the outside of your cupcake. Place 3 pieces of double sided tape evenly spaced around the cupcake wrapper. Add the rick rack ribbon on top of the double sided tape, gently pressing it all the way around the cupcake. 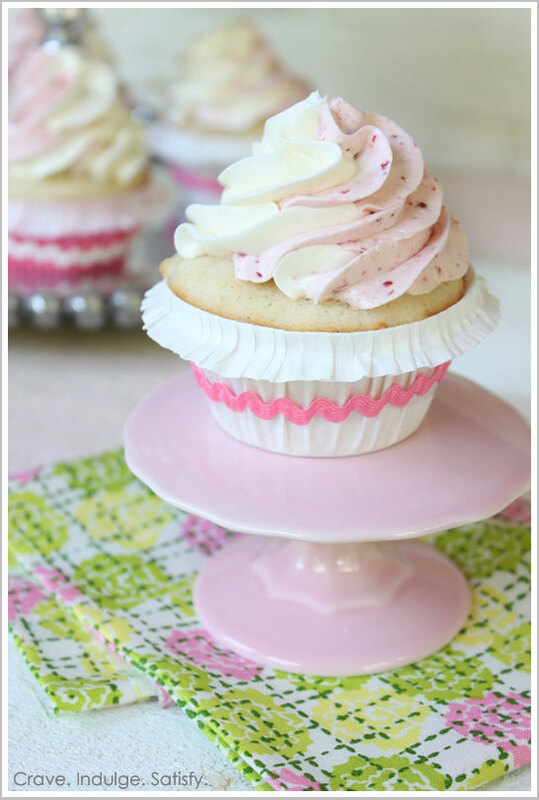 Hope you enjoy this recipe and fun way to embellish your cupcake wrappers! 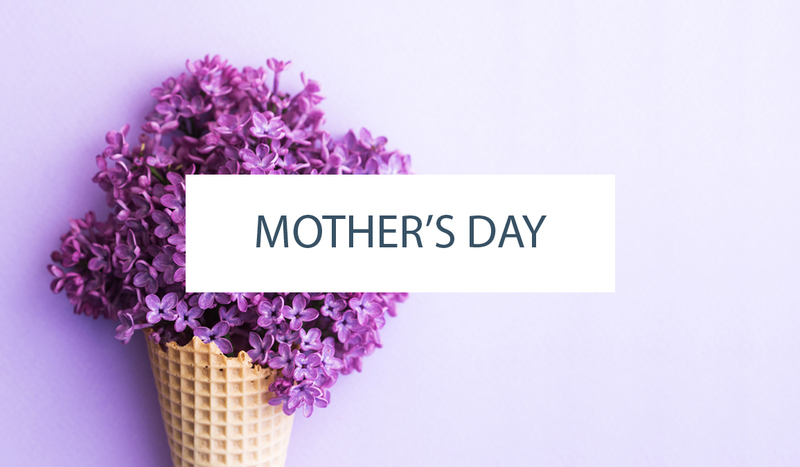 Happy Mother’s Day to all you moms out there! Thank you very much for taking the time to share these recipes and details for prep! I will be using all of these on a regular basis! have a sweet day! Where do you find the vanilla bean paste? I didn’t know that existed! What a great idea to swirl the frosting…..could use in so many other applications. Thanks, gonna try this! I have found the Vanilla Bean Paste at TJ Maxx, Ross, Hobby Lobby and William Sonoma! Hopefully you are able to find it at one of these stores too! You could also substitute the seeds of a vanilla bean in the recipe as well. Good Luck! This is such a good way to swirl the icing! Wish I would have thought of this a loooong time ago! You can also substitute pure vanilla extract for the vanilla paste, which would bring the recipe total to 1T plus 1t. these cakes look gorgeous and really nice to serve with summer on the way, ive never seen frosting done this way, cant wait to try these ! I am making these cupcakes for a baby shower…can I frost then a day early? with the frosting still look ok? I’m going to try these for sure, as they look really delicious. You recipe is very thorough, and I find it very useful. I already tried this recipe: https://www.squidoo.com/homemade-vanilla-cake-recipe; it’s for the vanilla cake though, but very tasteful. When I added the strawberries to the buttercream it was way too runny. How do you get yours to stay firm? I made it this weekend. The cupcake was fluffy and moist but a tad too sweet! :( I didn’t make the frosting but hope to in the future. I LOVE baking. Cakes are definitely my thing. I am now kind of breaking into the design aspect of cakes. Flavour, an important aspect of cake, I love playing around with, and though I have done Strawberry Vanilla cakes, I adore this version of the recipe. I am eager to try this out, I could not help myself from pinning it to my board. 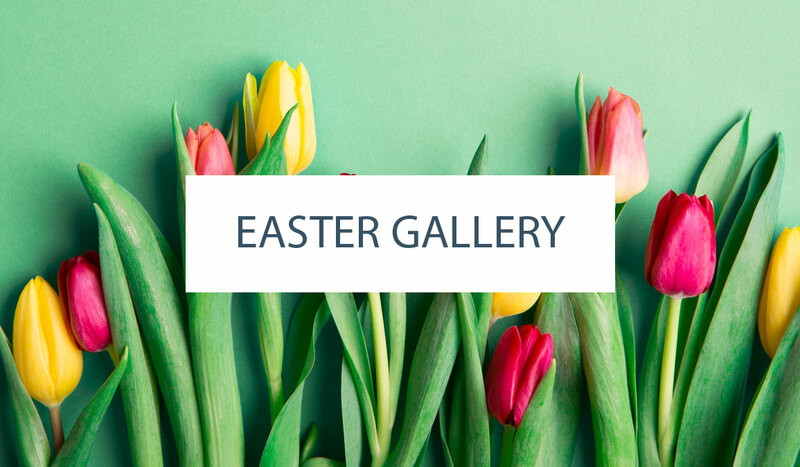 Gorgeous cakes – Keep up the EXCELLENT work.